Miglena Balcheva 1 , Angelina Kisselova-Yaneva2. 1) Faculty of Dental Medicine, Medical University, Varna, Bulgaria. Food allergy and intolerance are wide spread nowadays. However, the problem existed and was registered and described still by the ancients. It was fully understood and scientifically depicted in the 20th century after IgE and anaphylaxis were discovered, new diagnostic tests were initiated and the term “allergy” was introduced. There are some interesting aspects of the problem. Epidemiology is the first one – in the last two decades the number of people suffering from food allergy increased significantly and reached 4% of the population. Food allergy covers all ages, both sexes; atopic people and these with other allergic or digestive diseases are in the risk group also. There is certain influence of the eating habits as well. Etiology is rich and varied. It includes all foodstuffs of plant and animal origin, spices, honey, medicinal products - milk, eggs, meat, fish, nuts, fruits and vegetables, etc. Pathogenesis is complex. Key words: food allergy, oral allergy syndrome, hypersensitivity. Balcheva M, Kisselova-Yaneva A. Food allergy and oral allergy syndrome. Part I. A review. J of IMAB. 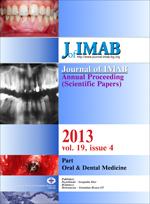 2013; 19(4):371-373. doi: 10.5272/jimab.2013194.371. 4. Rancé F, Dutau G. Food allergy. Expansion Formation et Editions, Paris, France, 2008. 14. Sampson HA. Update on food allergy. J Allergy Clin Immunol. 2004 May;113(5):805-19. [PubMed] [CrossRef] .